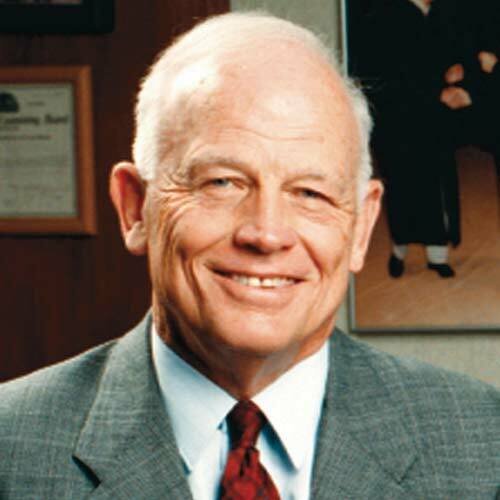 Dr. John H. Keiser is president emeritus of Missouri State University. During his 12 years at Missouri State, he initiated the planning, legislative and gubernatorial approval of the statewide mandate in public affairs education. The institution was one of five public universities, including the U.S Naval Academy, which received the Templeton Award for Character Building Institutions when it was recognized for both Institutional Achievement and Presidential Leadership. Keiser facilitated the total revision of general education at Missouri State, with an emphasis on public affairs, implemented higher admissions standards for students and increased the percentage of graduate students from 8 percent to 20 percent. Keiser retired from Missouri State University in 2005 and holds the title of Public Affairs Conference Chair Emeritus. As an historian, Keiser’s extensive bibliography includes works that have won literary prizes. His books include Building for the Centuries: Illinois, 1865-1898, Illinois Vignettes and an unpublished manuscript titled Be a Leader. Most of his writings emphasize the essential nature of public affairs, of participatory active citizenship, and of the importance of the natural environment. With those concerns, he served on a variety of boards and won numerous awards, including that of Citizen of the Year in Boise, Idaho, in 1991. The former president of Boise State University is known for his assertion that there has never been a great city without a great university. He was a candidate for mayor of Boise when he accepted the presidency of Missouri State University on July 1, 1993. Keiser received a BS in education from Eastern Illinois University with a major in social science and a minor in French in 1958 and an MA in 1960 and a PhD in history in 1964 from Northwestern University.